Activities in Cabo, Come play with us! Cabo San Lucas is not only popular for deep-sea fishing or shopping. Miles of sandy beaches on which to play attract whole families throughout the year. Every fun thing you would want to do when it comes to watersports and desert adventures in Cabo San Lucas can be booked at the Hotel Mar de Cortez. For more information speak to Ana at our front desk upon arrival and she or one of her assistants can direct you to one of the several local water or land activity outfitters. The area's most popular swimming beach is only a 20 minute walk (or a short taxi ride) from Hotel Mar de Cortez. Besides all of the water activities, there are some popular 'on the beach' restaurants where you can enjoy the magnificient view of Cabo San Lucas Bay and El Arco and the warmth of the Baja sun by day or crystal clear night sky and stars by night. Fun, romantic, gourmet specialties and simply relaxing! You can walk for miles on this Sea of Cortez beach...beautiful white sand and calm waters for swimming and cooling off. Golf has become the number two attraction in Los Cabos. Some world famous courses are now in the area designed by internationally recognized golfers and developers in the sport, Jack Nicklaus and Robert Trent Jones II. There are budget courses and championship courses, to name a few: CSL Country Club, Cabo del Sol, Cabo Real, Fonatur and Palmilla. 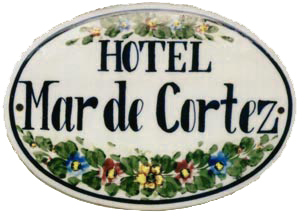 You can make your reservations from the front desk at the Hotel Mar de Cortez.